This morning, News Corp. CEO and majordomo Rupert Murdoch, his son James (who is also a top company exec) — as well as former employee and full-time lightning rod Rebekah Brooks — march on down to the British Parliament to answer questions from a committee there about the ever-growing PhoneGate scandal. For those living under a rock, News Corp. is embroiled in ever more serious controversy about who knew what and when (also where, why and how much) in the hacking of phones of a myriad of well-known people in the U.K. by its News of the World tabloid newspaper. Besides celebrities and politicians, that has included the voicemails of a murdered girl, an appalling act that has galvanized public opinion and the weak spines of legislators into action in this inquiry. It’s sordid, it’s ugly and it makes for what could be an explosive event, starring the man who brought you “Titanic,” Glenn Beck, “Glee” and, most recently, the sale of Myspace. There’s no question, getting the 80-year-old Murdoch on the ropes will be the aim of the committee members holding the hearing, and how one of the world’s most famous and legendary media moguls performs — or does not — will be a big deal to both interested observers and News Corp. shareholders. By way of full disclosure, that’s not me, but this site is owned by Dow Jones, which is owned by News Corp. In other words, somewhere up the corporate food chain, Murdoch is my boss. 6:36 am PT:: It all starts for the Murdochs, as soon as the former Scotland Yard head John Yates has completed questioning about the police’s obvious bungling of the various investigations over the years. Rupert Murdoch and his son, James Murdoch, are on, looking grave and dressed in grey. 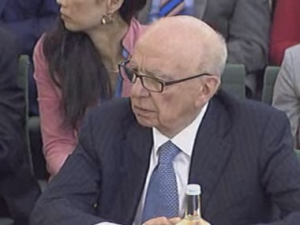 Sitting behind them are Rupert Murdoch’s wife, Wendi Deng, and his top adviser at News Corp., Joel Klein, who is heading up the phone hacking scandal internally at the company. The hearing — in a room that looks like a high school debate could take place there — starts off politely enough. But the first question is directed toward James Murdoch about his clearly incomplete investigation when phone hacking allegations were first made many years ago. He begins with an apology. “These actions do not live up to the standards of News Corp.,” says the younger Murdoch. The questioner quickly asks the obvious query, after James Murdoch claims News Corp. was not in full possession of the facts when execs had told a previous committee there was no reason to believe there was more widespread hacking. Were News Corp. execs lying? James Murdoch continues to insist that the bulk of evidence came out — “real evidence” — in later civil trials. And also, that News Corp. is now investigating the situation fully. He throws around words like “proactive action” and “transparency,” which is probably cold comfort now to those hacked when things were less clear to News Corp.’s senior management. Now up, Rupert Murdoch, who is asked quickly about statements he made about not tolerating wrongdoing and who had lied to him at News Corp. about the phone hacking. Apparently, he “didn’t know” a lot about the hacking that took place, while also defending the non-hacking employees of his company. But the questioner is still on him about exactly what he did know about the situation, which seems to be — at least according to his testimony — a lot of I-don’t-knows. 6:53 am: It continues about what Rupert Murdoch knew and when he knew it and what he did. Or not. As Rupert Murdoch keeps up with this tone of not being clued in to what have turned out to be critical events, James Murdoch wants to keep jumping in with the details, which he is eager to impart. “At what point did you find out criminality was endemic at News of the World?” asks the questioner. Rupert Murdoch does not like the word endemic, but stresses that he was “shocked, appalled and ashamed” by the case of the murdered girl, Milly Dowler. The questioner seems frustrated by Rupert Murdoch’s answers, which are, for the typically razor-sharp media mogul, unusually slow. Like a persistent terrier who wants to perform, James Murdoch is back again offering to serve up the deets. 7:04 am: Now, it is onto the closing down of News of the World: Was the tabloid shut down because of the criminality? A new questioner is on, with a bizarre query about why Rupert Murdoch came in the back door of the Prime Minister’s house at 10 Downing Street on a recent visit there. It’s a cloddish effort to show him as a powerful puppetmaster to pols, but only serves as a punch line. Back on track, with questions about whether there was hacking in the U.S., which Rupert Murdoch said he could not believe had happened. More questions about how badly the company acted, which came down to the questions about whether he was “ultimately” responsible for the hacking. “Nope,” says Rupert Murdoch, who keeps insisting he relied on others, some of whom apparently “misled” him. It’s an astonishing admission and, really, excuse, given he has been chairman, CEO and a very strong leader of News Corp. for more than a half-century. 7:16 am: A new questioner, who asks who decided to close down News of the World. It was Murdoch himself, his son and other execs. Next up, why did News Corp. pay off a victim of hacking, which James Murdoch did without informing his father or the News Corp. board. James Murdoch essentially points out that it is typical to do this in companies of the global scale of News Corp. These are apparently very busy, busy, busy people, who do not seem to have time to notice how such juicy and best-selling scoops might have been magically produced by News of the World. Onto ethical conduct guidelines, which News Corp. has in a pamphlet form, says James Murdoch, but pages which some at the company have obviously never cracked. Rupert Murdoch is asked again about his culpability in the case, which he continues to maintain he does not shoulder the blame. Given the situation, in which every day brings a new revelation of bad acts by News Corp. employees, this promise of better behavior seems to be a case of much too little and very, very late. Rupert Murdoch still uses the opportunity to stress the need for a free press, despite its excesses. 7:31 am: More about the payments to settle with phone hacking victims and how soon the company realized the problems were more widespread. James Murdoch talks about how he might have acted differently had he known more then as he does now. But what else is he going to say? It’s a could-have, would-have, should-have line of questioning that is eliciting very little in the way of true information. Finally, a good point about “willful blindness,” which is a term from the Enron scandal about avoiding knowing about problems you really should have known about. “Is that a question?,” asks James Murdoch. It is a statement, actually, and a decent enough one. “We didn’t do that,” says Rupert Murdoch firmly this time. Still, soon enough, Rupert Murdoch is insisting he was not as involved as people have imagined him to be with the management of his newspapers. A new questioner is pressing this important point, but Rupert Murdoch is not biting on a query about his legendarily hands-on managing style. “I’d say, ‘What’s doing? '” he explains about his conversations with editors, but adding he might not have been told about payoffs to phone hacking victims. The questions are in the deep weeds here, but it’s still interesting that Rupert Murdoch continues to maintain that his life was too busy to wallow in the details, however controversial and important those details might be. 7:55 am: More and more don’t-knows pile up and up in a giant mountain of acts perpetrated by someone somewhere, but not the Murdochs. “I can tell you I was surprised as you were,” says James Murdoch about certain payments to various hackers and those who were hacked. Was it Les Hinton, who then ran News International and later Dow Jones, from which he recently resigned? Could be! Maybe! Mistake were made! Who knows! It moves onto Brooks, the tarnished News International exec and editor whom Rupert Murdoch does note he still trusts. Finally, some certainty! Brooks is definitely one of the more compelling characters in this drama, although the media focus on her striking red hair color seems odd and vaguely sexist, as if she is some flame-haired she-devil from media hell. She might certainly be guilty in this mess, but her fabulous hair has nothing to do with it. Fascinatingly, Murdoch’s backing of Brooks has been strong and consistent, despite intense criticism of her by many in this scandal. The payment of legal fees of perpetrators and payments to the victims in the hacking seems to obsess one questioner, who wants News Corp. to stop doing it. Murdoch says he’d like to if contracts did not preclude that, which essentially means News Corp. will keep up forking over the legal fees and payments. 8:12 am: The attention turns to how James Murdoch found out about the various emails that showed there was more evidence of hacking than was first thought about and what he felt about it. He says very little, noting that the matter is under police investigation. It’s not don’t-know now, but can’t-say. The hearing is beginning to feel a little rope-a-dope, with the Murdochs apologizing and taking blows, saying very little — either claiming lack of knowledge or lack of ability to comment about the ongoing police inquiry — and tiring out the questioners. It is a classic tactic of the boxing champion Muhammad Ali and it works in the ring. Whether that will be the case with PhoneGate remains to be seen, but it certainly has made what could have been a more explosive hearing much less so. Instead, it seems to have turned into a what didn’t the Murdochs know and when didn’t they know it hearing. On questioner gets this irony. “That’s frankly unsatisfactory,” he says about the Murdochs continuing shock and surprise at the thorny situation they find themselves in. Maybe it seems a little hard to believe, but the persistent story from James Murdoch is that they were told by their lawyers, the police and others that nothing was awry once the initial phone hacking investigation was complete and only found out about the larger problem in later civil lawsuits. But, asks the questioner to Rupert Murdoch, should his editors and managers at News of the World have known about it? Of course, they should have. But, once again, the legendary media baron, who made his fortune and fame in disseminating news and information across the world in newspapers, on television, on satellite and on the Web — at least for now — can’t say. So, was he “kept in the dark” about the situation? Rupert Murdoch acknowledges he might have asked more questions, although he noted his British newspapers were only a small part of his massive empire. Well, not the phone hacking crisis, it seems. But, they’re sorry. So sorry. And, of course, humbled. 8:54 am: Suddenly, there is a disturbance, in which someone seems to have possibly attempted to accost the Murdochs. But it is not clear what has happened, as the hearings are suspended for 10 minutes. James Murdoch leaps up quickly to protect his father, which he has been doing in this hearing verbally already, where the strategy seems to be to let him largely do all the talking. Even faster on her feet and with arms raised toward a man in a plaid shirt and carrying a pie plate with shaving cream is Rupert Murdoch’s wife, Wendi. The man seems to have managed to get some of the foam on Rupert Murdoch, but Wendi Deng appears to have partially thwarted her husband from receiving a full pie in the face. It’s the first striking visual of this hearing, protecting the patriarch and the king of the empire from harm, no matter what. 9:09 am: The room is cleared, so it is only the Murdoch crew behind James and Rupert Murdoch, and now the committee is even more solicitous. Rupert Murdoch is without his jacket and his wife is being commended for her most excellent left hook. Still, it’s back to business and the questioner does zero in on a major disconnect over how two media execs as famously aggressive and involved as the Murdochs were so passive in this hacking situation. It “was a terrible shock,” says James Murdoch. The same is said about what would be even more disturbing and recent allegations of the hacking of the victims of the 9/11 bombings. Both father and son say there is no evidence of this so far, but they were surely looking into it. While it certainly did not come through in what have largely been feckless questions from the committee, the final questioner does correctly ask the pair if they might want to pay more attention. The last question is for Rupert Murdoch and finally gets to the real query everyone wants to ask. Noting Murdoch is “captain of the ship,” she asks if he has considered resigning. He finishes up with a statement about being sorry, how he was also betrayed and how phone hacking and bribery is wrong. “Saying sorry is not enough, things must be put right,” he says. Finally, something we do know.